Granola. A breakfast staple to so many of you, with granola sales up by 20% last year (Grocer uk) and so many brands to choose from its a fantastic, energy fuelling ‘go to’ breakfast or snack. However, be warned.. many ‘healthy’ granolas are jam packed with refined sugar and dried fruit coated in sugar which in reality does not make a healthy mornings breakfast. 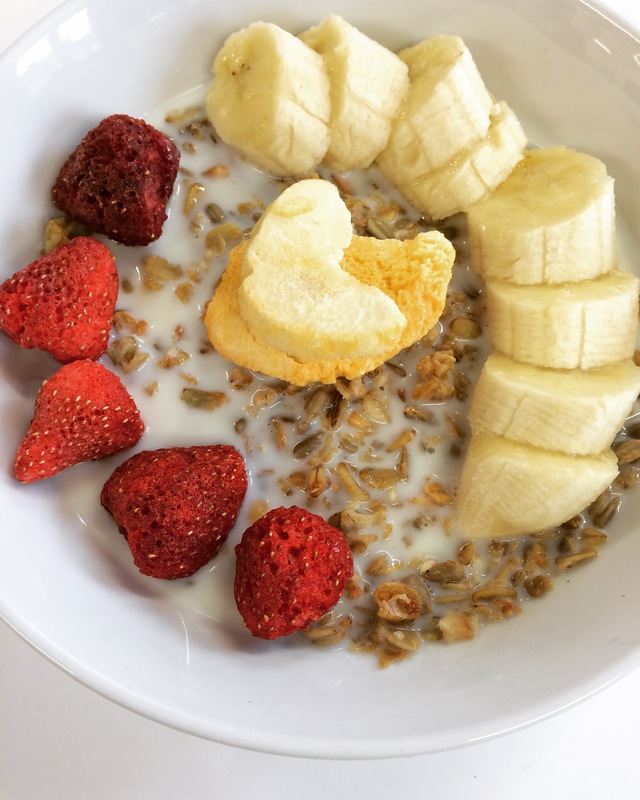 Along with the high sugar content, many brands add fats such as palm oil to their granola which raises saturated fat levels and overall makes a pretty unhealthy breakfast, that will leave you feeling hungry faster too. This doesn’t mean to say all granolas should be tarred with the same sticky brush! 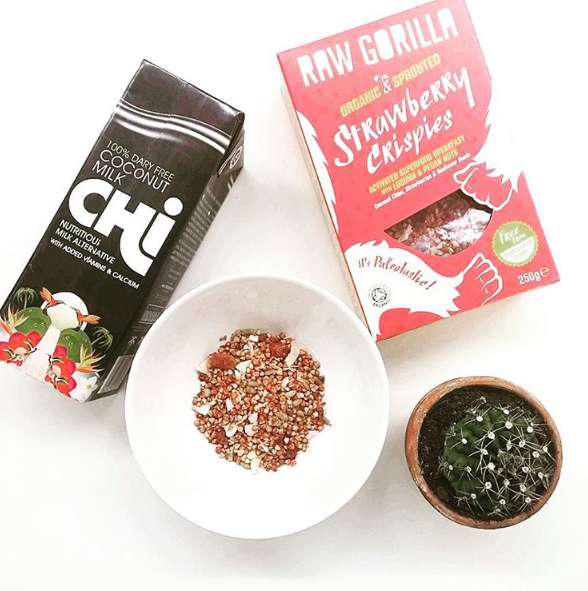 We are loving Raw Gorrilla Strawberry Crispies at the moment, a completely Raw, Gluten free, Vegan, Paleo cereal! With no additives or preservatives and blended with amazing superfoods like raw cacao, lucuma & macs it goes perfectly with Chi Coconut Milk too! We also LOVE making our own! The most important bulk ingredient to the granola should be the whole oats. They are full of fibre, high in protein, and contain vitamins and minerals like folate, iron, and magnesium. Make sure when you buy your oats, they are labelled as 100% pure whole rolled oats, nothing that says “instant” or “quick cooking or any added sugar or sweeteners! Nuts and seeds make a fantastic addition of protein, texture, flavour and Vitamin E. A small amount of unsweetened dried fruit is ok too, just make sure it’s unsweetened to keep the sugar content down. Here at Giving Tree, we realised it’s easier than you think to make your own delicious granola, which we found topped with Giving Tree fruit crisps makes a bowl of pure, healthy goodness! Here’s our favourite recipe, but remember you can add your own favourite additions too – just remember to check the back of ingredients and aim to avoid sweetened nuts and fruit. You can reach your own desired sweetness with the addition of coconut sugar (low GI) or a small amount of extra honey. Heat oven to 150C/fan 130C/gas 2. Mix the oil and honey together in a large bowl. Tip in all the remaining ingredients, except the dried fruit and coconut, and mix well. Tip the granola onto two baking sheets and spread evenly. Bake for 15 mins, then mix in the coconut and dried fruit, and bake for 10-15 mins more. Remove and scrape onto a flat tray to cool. Serve with cold milk (chi coconut milk tastes delicious on the granola), yogurt and or as a snack to go! Don’t forget to add your Giving Tree fruit crisps on top for a delicious and nutritious crunch! We love to hear from you so please feel free to say hello and tell us what you think of our snacks!